Showpax can provide drivers and chauffeurs for either your own vehicles or those leased to the event as a promotional tool. Our comprehensive database of drivers covering the whole of the UK enables us to allocate the required driver skills to the job in hand. Many of our drivers are experienced in personal protection, and all are selected to ensure that you receive a quality service. All our drivers are experienced in corporate work, and many have driven for high-ranking government officials and royalty. 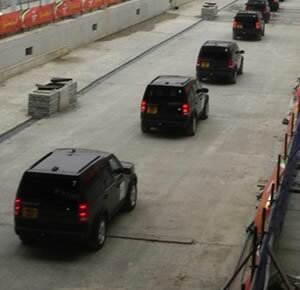 Pictured left are LandRover Discovery vehicles about to drive members of the International Olympic Committee through the rail tunnel that eventually linked the Olympic Stadium with Central London, during the inspection visit in February 2004. The Client organised the creative project, with LandRover providing the vehicles and Showpax providing highly trained specialist drivers. Showpax will source, brief and supervise drivers, whether large numbers are required or just one driver. Our experienced planning team will ensure that all supporting functions are in place to guarantee the smooth running of the programme.